Most office workers stick to wearing a shirt and trousers. 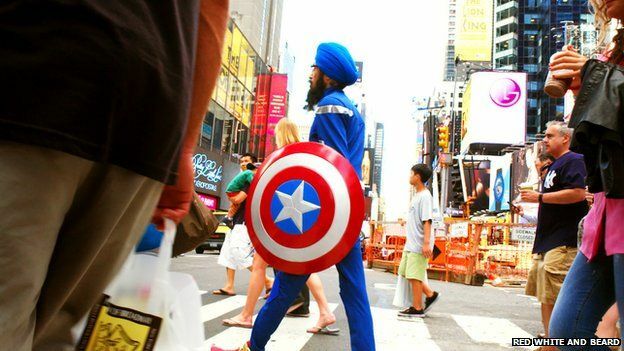 So why has a Sikh man in his 40s been talking to strangers in New York while dressed as Captain America? So says Vishavjit Singh, a mild-mannered software engineer by day and passionate cartoonist by night. The 43-year-old’s fellow Americans have not always been so welcoming. A devout Sikh, complete with traditional turban and flowing beard, Vishavjit – or Vish as he is known – has always attracted attention. “I’m still seen by many as the ‘ultimate other’ in American society -a radical Muslim. Harassment goes up and down depending on the news,” he says. He turned to his hobby of drawing as an outlet, creating cartoons depicting what life in America was like for Sikhs – focusing on the patriotism he felt for the country he was born in and the pride for the religion he belonged to. A local comicBOOK convention provided the perfect opportunity for him to get his work noticed and it was there that he met a photographer who suggested he bring the character to life – by dressing up as Captain America himself. “My first response was, ‘no way’. I’d never worn a costume and I’m a skinny guy who’s been kind of teased and bullied all my life,” he says. Then things changed. In August 2012, six people were killed after a US Army veteran with ties to white supremacist groups opened fire on worshipers at a gurdwara in Wisconsin while preparations for a service were under way. The incident forced Singh to once again reassess the way minorities like himself were being perceived in America. His cartoons were a way of tackling the stigma faced by Sikhs, but the self-confessed introvert felt he still had to do more. It was then that he remembered his earlier conversation at the comic convention. He swiftly ordered a bespoke Captain America suit tailored to fit his slender 5’9″, 130 pound (58kg) frame. Singh began visiting college campuses and youth retreats dressed in character – complete with Captain America’s trademark shield and an ‘A’ on his turban – giving talks about social identity and life as a Sikh. It was at one of these talks that he met three filmmakers – Ryan Westra, Ben Fischinger andMatthew Rogers – then students, who were intrigued by the message Vish had come to deliver. “Vish was born in the United States, has no accent at all but regardless, most people assume he’s born from somewhere in the Middle East,” says 23-year-old Westra. “Despite being the fifth biggest religion in the world, not many Americans know a thing about Sikhism”. The friends approached Singh with an idea – he would walk around New York City for three days in full costume, and they would capture the experience on film. The film, ‘Red, White and Beard is now available to watch online. Filming across three days meant travelling up and down New York, providing Singh with the opportunity to strike up conversations with locals, including a chance encounter with a fellow commuter on the subway. “It turned out he was a cop who was there on the scene during 9/11 and had just come back from visiting the memorial site for the first time. He told me as a white, conservative Christian from the Southwest, he loved me and what I was doing,” he says. And it’s for such encounters that Singh plans to keep patrolling the streets in full costume. For him, the iconic comic book character has become an important part of who he is. “You see, Captain America is the ultimate hero – he’s patriotic, strong, the uniform has the red, white and blue. He’d been created to fight actual bad guys in the Second World War,” he says.